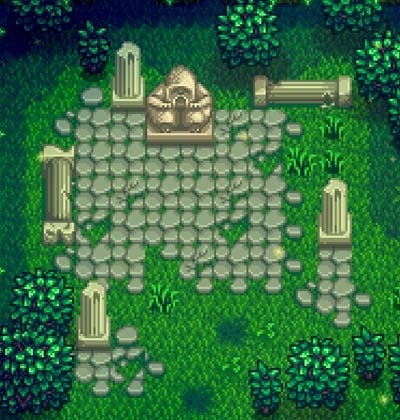 The stone statue of Old Master Cannoli is located inside the Secret Woods, in the very top left corner. The statue reads: "Old Master Cannoli... still searching for the sweetest taste...". If you buy and grow a Rare Seed from the Traveling Cart (for 600-1,000g) and then give the statue the resulting Sweet Gem Berry as you would give a present, the statue's eyes will turn red and it will give you a Stardrop. This will only work one single time. After that, you won't be able to interact with it anymore. Old Master Cannoli may be a reference to "Obi-Wan Kenobi" from the Star Wars Series, as the two share similar appearances, and their names even sound similar. This page was last modified on 8 November 2017, at 15:56.